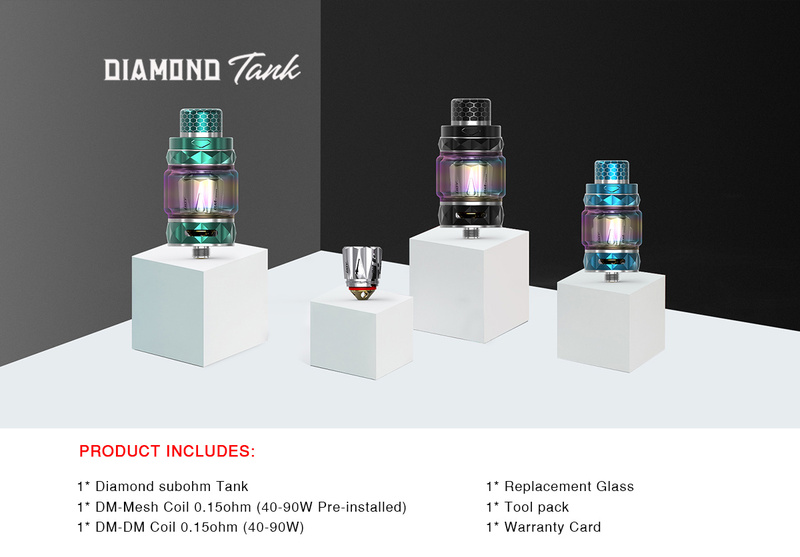 IJOY DIAMOND SUBOHM TANK is a large airflow, great vapor, good flavor atomizer, widebore 810 resin drip tip, stylish diamond design, a variety of processes, 180° fast screw-cap filling. Equipped with DM- MESH mesh coil and DM-DM diamond-like coil with uniform heating characteristics. Using Organic Fiber Cotton, full of ejuice, soft and delicate taste, high degree of reduction, lasts longer! Diamond coil is IJOY's innovative coil. The porous dense arrangement increases the contact area between the heating wire and the cotton. The heat is faster and more uniform. The ejuice can be more fully atomized and restores the taste of the ejuice. At the same time, the use of Organic Fiber cotton, full of ejuice, highly retained the original taste!